In the year of the thirtieth anniversary of the company, Chronoswiss proudly makes its debut at the Only Watch auction in the fight against muscular dystrophy. For the first time in the history of the brand, it has created an in-house handcrafted unique watch featuring various rare crafts and arts. “The Three Apes” is a piece of art dedicated to the traditional crafts of guilloche main, skeletonization and fire enamel. The resuscitation of these historical, to a degree almost forgotten, handcrafts is something that is near and dear to Chronoswiss CEO Oliver Ebstein who founded a special workshop at the brand´s headquarters in the Swiss town of Lucerne in spring 2013. Here, ticking treasures like “The Three Apes” are created by artists, partially with the aid of historical tools, such as an antique rose engine built in the year 1924 in La Chaux-de-Fonds. 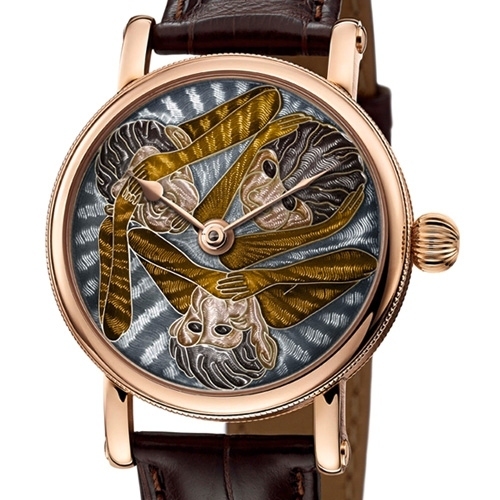 The unique thing about this piece of art is the incorporation of various demanding techniques in one watch. The dial of Chronoswiss´ contribution to the Only Watch has first been lavishly decorated with guilloché main and then lent a fascinating depth and three-dimensionality thanks to transparent fire enamel on top. The three apes featured on the dial are a symbol of the typical human reaction to diseases (denial), and are meant to create awareness for the cause of muscular dystrophy. While the dial as the “face” of the watch receives a lot of attention, the insides of the timepiece, which are visible through the transparent case back, also create a great amount of fascination. The manually wound movement is lavishly decorated: with goldsmiths’ saw and file, the skeletonizer goes to work; bridges and plates are later embellished with guilloché décor. The front and back of each wristwatch are so gorgeously embellished that it is difficult to say which perspective offers the more refined views. Regardless of the side that you begin with when admiring this model, you will always see a work of art entirely created by hand. Large wristwatch (hand-wound), with guilloche main décor, fire enameled and engraved by hand, movement skeletonized by hand.